Dangerous waters? A child cools off in HCMC. 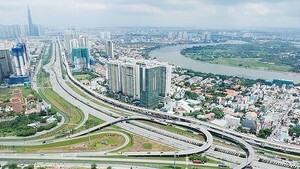 The Saigon Water Supply Corporation (Sawaco) has drawn upon the expertise of Civil Engineers from the France-based International Association of Francophone Mayors and City Officials (AIMF) in an attempt to overcome long-running problems associated with higher than normal concentrations of iron and manganese in HCMC tap water. As a result of their investigation, the French experts determined that the abnormal level of iron was due to the leakage of eroded material from the pipe’s protective covering into the water supply. To overcome the problems, AIMF’s experts suggested that the city make changes to the water system’s overall structure and operation in order to reduce turbidity in the piping network. They also recommended revamping the filtration system and fixing or replacing existing pipelines as required. Le Hoang Quan, chairman of the Ho Chi Minh City People's Committee, yesterday approved Sawaco’s proposal to continue working with the AIMF’s experts. The project, with an estimated expense of EUR500,000 will begin in early 2007.